They are soooooooooo much fun!!! Thiese have such a painterly feel to them. Something between antiquities and renaissance. Maybe they’d be worn in Dutch master paintings. 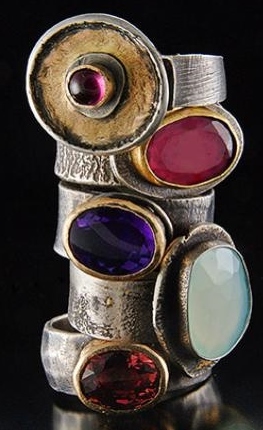 I love these rings and I love her website. I’m a beginning metalsmith student and plan to begin my first ring on Saturday. So inspired! Thank you for introducing us to this wonderful jewelry artist :). Karen, I also love the rings. Simple…yet striking. Good luck with your ring project. To advance from beginning metalsmithing to intermediate, my last project was a rolling ring…a bit of a challenge…but it is my pride and joy and I wear it every day.